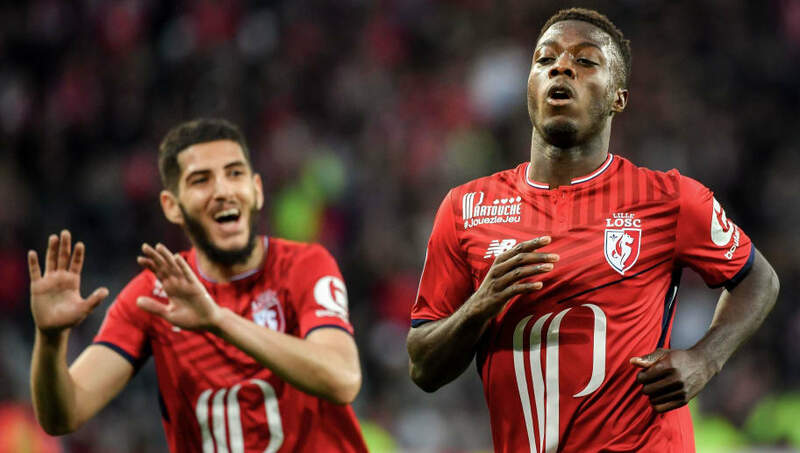 Lille's Ivory Coast International winger Nicolas Pepe has welcomed transfer speculation linking him with Arsenal as well as a host of top European clubs. The Ivorian has been in scintillating form this season and has contributed eight goals and five assists in 13 Ligue 1 games, second only to ​Kylian Mbappe who has combined total of 15​. The winger has inevitably drawn attention for his performances, with ​Arsenal believed to have scouted the player. ​Borussia Dortmund and Bayern Munich are among those who are also said to be interested. When asked about the rumours, Pepe told Telefoot as quoted by the Evening Standard: "A preference between ​Dortmund, ​Bayern or ​Arsenal? They’re all big clubs, I was not aware of these rumours, although it’s nice." It is believed Unai Emery is interested in bringing in another attacking option, with Pepe offering more natural width than central strikers ​Alexandre Lacazette and ​Pierre-Emerick Aubameyang. Arsenal have lacked natural wide players following the departures of Alex Oxlade-Chamberlain and Theo Walcott to Liverpool and Everton respectively in recent seasons, with Henrikh Mkhitaryan and Alex Iwobi often cutting inside from the wings. The Gunners are in good form of late, drawing with Liverpool 1-1 on Saturday, and take on Sporting CP in their next Europa League tie on Thursday.